If you want a glimpse into the future, you don't have to imagine, as George Orwell once famously said, "a boot stamping on a human face, forever." In fact, one doesn't need to imagine anything. 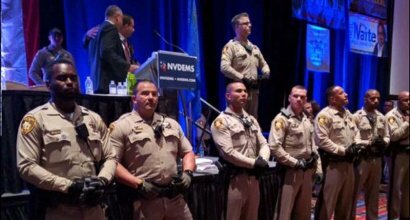 All one has to do is review the recent Nevada Democratic Convention and how shamelessly it conducted itself. 64 people who either had credentials to be Democratic delegates or had their credentials changed (including the usual SNAFU of having party affiliations changed from Democrat to Republican), were turned away, even after some of them provided proof they were who and what they said they were. Most of these people, surprise, surprise, were Bernie delegates. A voice vote that clearly signaled "Nay" was blithely ignored by Lange and she testily banged her gavel and adjourned the entire convention as she'd decided the Ayes had it. After Bernie Sanders won the county conventions, the Nevada "Democratic" Party hastily rigged the game to favor Clinton and awarded her most of the delegates. Lange moved to change the party rules while Bernie delegates were still waiting in line to register while Clinton delegates, for some maddeningly elusive reason, showed up earlier. This would ensure Sanders delegates couldn't raise their voices, ensuring the new rules clearly favoring Clinton wouldn't even be challenged. The usual assortment of alleged thuggery on the part of Sanders supporters that resulted in not a single person getting thrown out of the convention hall by the massive law enforcement presence. People, there is nothing democratic about the Democratic Party on either a state or national level. We know that Hillary is shamelessly hitting the phone banks and sucking up to Bush donors for more cash. We know the Democratic convention in Philadelphia this year will be backed and financed by right wing corporations and lobbyists (Allowing corporate payola to fund the convention was previously forbidden until Wasserman Schultz, who never met a CEO she didn't love, quietly changed that rule way back last October). One is tempted to borrow a tactic from the Republicans during the Bush years and refer to the Democratic Party as the Democrat Party because, especially after Nevada, there's nothing even remotely democratic about the Democratic Party. We saw much of the same thing in Boston 12 years ago when in advance of the Democratic convention, snipers were posted on roofs and protesters were shunted to "Freedom cages"several blocks away from the front entrance of the Fleet Center so John Kerry, that year's sacrificial lamb, and the delegates wouldn't have to hear others exercising their First Amendment rights. And heaven forbid Sanders supporters rightly call "Foul" on social media or elsewhere. They will be swiftly shouted down by brand new accounts with almost no followers by paid Hillary trolls and undeclared right wing zealots sneering about them whining and nonexistent violence. The shamelessly corrupt and collusive Nevada convention was just a pinprick of what we'll see in the cradle of liberty and democracy this July. And it will not be a pretty sight.